Today I read, "84, Charing Cross Road". The movie by the same title is one of my favorites. It's a very simple story of the love affair between Miss Helene Hanff of New York and Messrs Marks and Co, sellers of rare and secondhand books, at 84 Charing Cross Road, London'. It's based on a true story. I read it in under an hour. On my way home, while making mental plans to watch the movie after I put the kids to bed, I ran a stop sign and got a ticket. When the officer asked me why I ran the stop sign, I told him I read a great book today, and I couldn't stop thinking about it. I didn't even mind getting the thicket. 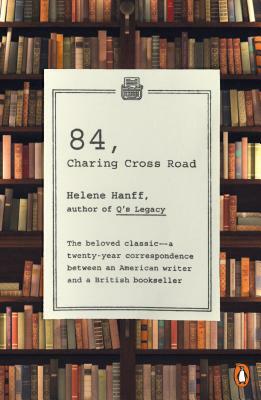 This charming classic love story, first published in 1970, brings together twenty years of correspondence between Helene Hanff, at the time, a freelance writer living in New York City, and a used-book dealer in London at 84, Charing Cross Road. Through the years, though never meeting and separated both geographically and culturally, they share a winsome, sentimental friendship based on their common love for books. Their relationship, captured so acutely in these letters, is one that has touched the hearts of thousands of readers around the world. Helene Hanff (1915–1997) was born in Philadelphia, Pennsylvania. In the 1940s and ’50s she wrote plays and television scripts in New York City, but found little success until her best-known book, 84, Charing Cross Road, was published in 1970. The book was a smash hit and has been adapted for the radio, stage, film, and television.